Speedskating Probe Finds No Pattern of Abuse : The Two-Way A team of independent investigators concluded Friday that there is no evidence of patterns of physical and emotional abuse in the coaching of American short track speedskaters trying to reach the Olympics. 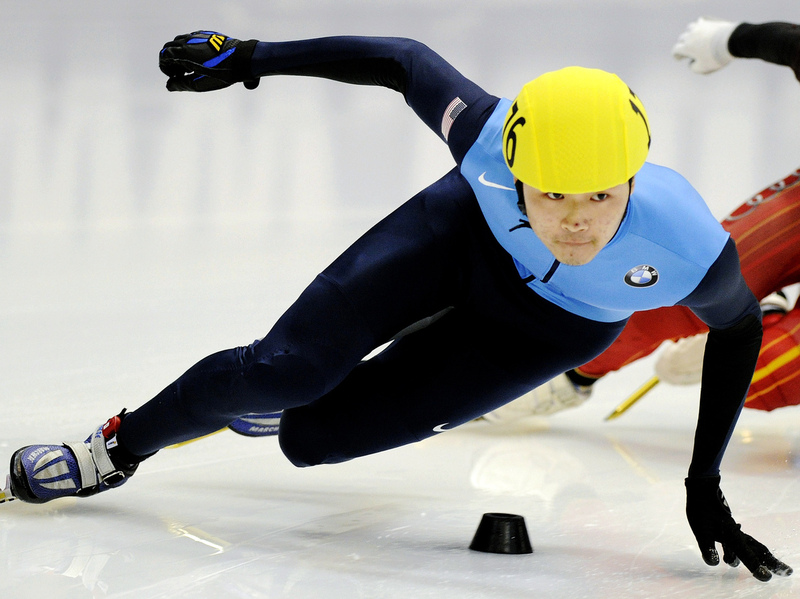 U.S. speedskater Simon Cho competes at the Short Track Speedskating World Cup in Dresden, Germany, in February 2011. Cho said he bent the blade of a skate used by Canadian Olivier Jean at an international meet in Warsaw, Poland, last year. A team of independent investigators concluded Friday that there is no evidence of patterns of physical and emotional abuse in the coaching of American short track speedskaters trying to reach the Olympics. Nineteen current and former skaters, including five Olympic medalists, had filed abuse complaints against Jae Su Chun, the head coach at U.S. Speedskating, and assistant coach Jun Hyung Yeo. "The skaters that have made those allegations made them with the utmost sincerity," said investigator Greg Little, an attorney with the White and Case law firm in New York, which conducted the probe as part of a U.S. Olympic Committee effort to address allegations of abuse in Olympic sports. Little added that the finding of no patterns of abuse "does not mean we are condoning the methods or the tactics that were used by the U.S. Speedskating coaches." The finding is "not exoneration," Little added, nor is it an "endorsement" of the position taken by nine skaters, who defended their coaches. Little also noted that neither U.S. Speedskating nor the U.S. Olympic Committee have defined standards for abuse. Investigators resorted to a dictionary definition and now leave the abuse allegations to an arbitrator, who is holding a hearing in Salt Lake City on Nov. 1. Discerning abusive behavior is "very difficult," Little said. "And I think the arbitrator would also find it difficult as well." The investigators turned over an Executive Summary of their report to U.S. Speedskating; it was not made public until Friday evening. The probe also addressed the explosive sabotage admission by 500-meter world and national short skate champion Simon Cho. Cho told NPR this week, and reaffirmed at a news conference in Salt Lake City Friday, that he had bent the blade of a skate used by Canadian Olivier Jean at an international meet in Warsaw, Poland, last year. Jean was unable to complete a relay because the skate didn't track properly on the ice. In a statement, U.S. Speedskating said the group is "shocked and disappointed by Simon's actions" and is immediately convening a disciplinary panel "to determine the appropriate course of action." But the investigators said they could not corroborate Cho's claim that Coach Chun badgered him into tampering with Jean's skate. "There were conflicting, contradictory reports of what actually took place," Little said. "We do not believe that there is sufficient evidence to conclude that Coach Chun directed Simon Cho to tamper with the skate." Little noted the limitations of the independent investigators. They could not subpoena witnesses. Testimony was not taken under oath. And opposing lawyers could not question and cross-examine the principals. It may take the Nov. 1 arbitration, Little suggested, to sort out what actually happened. "We offer our best judgment," the Executive Summary says, "mindful that an adversarial proceeding under oath could generate a different conclusion." Still, Coach Chun and assistant coach Yao face a USS disciplinary proceeding because both told investigators they learned about Cho's sabotage immediately after it occurred but did not report it. The investigators' Executive Summary says that in initial interviews, "Coach Chun, Assistant Coach Yeo and Simon Cho misled us about what they knew had happened in Warsaw." Chun was placed on administrative leave last month when the abuse allegations first surfaced. Yao was serving as interim head coach until Friday, when he was also placed on administrative leave. That leaves U.S. Speedskating without any coaches as skaters prepare for the first two meets in the 2012-2013 short track World Cup season in Canada in two weeks. "We're in the process of trying to find a coach who can take over coaching duties," said U.S. Speedskating spokeswoman Tamara Castellano, who indicated an interim coach is expected to be in place Monday. Cho called skater Olivier Jean Thursday night to apologize for disabling the Canadian's skate last year. "Simon Cho showed respect and humility today in admitting his mistake," said Speed Skating Canada CEO Ian Moss, who added that his group "appreciates that he has come forward and he apologized to Olivier." Cho faces sanctions that could range from a warning to suspension to banishment from the sport. The International Skating Union conducted the competition in Poland where the tampering incident occurred. In a statement, the ISU said it "is informed and following the developments." USOC spokesman Patrick Sandusky condemned Cho's behavior, calling it "repugnant and antithetical to the values of the Olympic movement." The USOC, Sandusky said, intends "to actively engage with U.S. Speedskating to ensure that appropriate action is taken." The investigators also addressed organizational, funding and management problems at U.S. Speedskating that "gave rise to significant dissatisfaction" among skaters, including "a general perception among skaters that no one at USS would listen to them about their concerns, much less act on them." Some of the issues mentioned by investigators are part of the complaints that will be scrutinized during the Nov. 1 arbitration.